Fireworks marked the launch of Potain’s MCT 178 tower crane at Komatek 2013, the international construction equipment trade show held May 29 – June 2 in Ankara, Turkey. The 8 t capacity crane offers improved transport, fast assembly and an impressive load chart, making it ideally suited to the growing number of high-rise construction and infrastructure projects in Turkey. The two MCT 178s at Komatek were displayed by Tekno Insaat Makinalari, the local Potain tower crane dealer. The company has ordered 25 MCT 178s for its rental fleet with an additional three units already sold to Turkish construction companies, much to the delight of Sinan Türeyen, group director of Tekno. 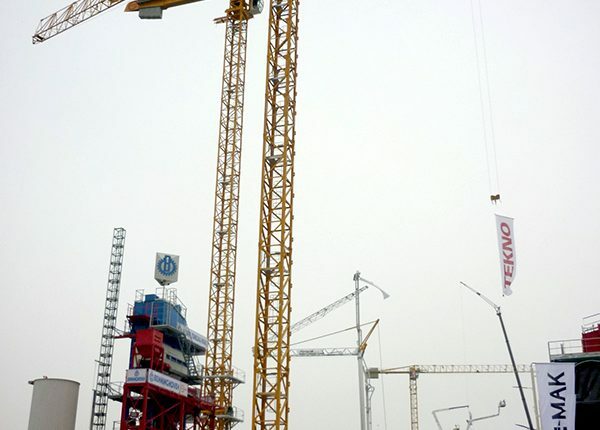 The two MCT 178s were the tallest cranes at the trade show, with one erected up to 67.6 m above the exhibition grounds. Both cranes were equipped with Manitowoc’s Top Tracing anti-collision technology. Tekno’s first MCT 178 in the field will operate a high-rise construction project in central Istanbul where it will work at a height of approximately 200 m. The crane was chosen for the job for its 60 m jib and impressive load chart. Manitowoc is also targeting Africa, Russia and surrounding CIS countries as key markets for the MCT 178. Modeled on the successful Potain MDT 178 crane, the Potain MCT 178 uses Potain’s L-type mast, which is available in 1.6 m or 2 m sections. Both sizes can be used in the same mast configuration to offer better flexibility on site and to reduce costs. The crane is also designed for easier transport. The counterjib, for example, is a single monoblock design and the ballast support can be easily folded. The crane’s upperworks, including the counterjib, a 60 m jib and the 50 LVF hoist winch, travels on three trucks. The cab itself is permanently attached to the towerhead, but is mounted on hinges so it can rotate so it can stow in a space-saving manner for transport purposes. The cabin and tower head hoist can be lifted as a single element by a larger mobile crane for less assembly in the air and to streamline the erection process. Mechanisms are in one location, improving communication between crane operators and service engineers for more efficient erection or disassembly. The MCT 178 features Potain’s Smart View cab, which is compact and offers excellent visibility and comfort. The new cab also features a sleek, modern design and is covered in a special anticorrosion coating. Based in Istanbul, Tekno has represented Potain tower cranes in Turkey since 1990. The company is regarded as a leader in the supply of construction equipment in Turkey, and offers rental, sales and after-sales services across the country.